Island principals attended school committee meeting last week. From left, Megan Farrell (Oak Bluffs), John Stevens (Edgartown), Sara Dingledy (high school), John Custer (Tisbury), Donna Lowell-Bettencourt (West Tisbury). Not pictured is Susan Stevens from Chilmark who arrived later. 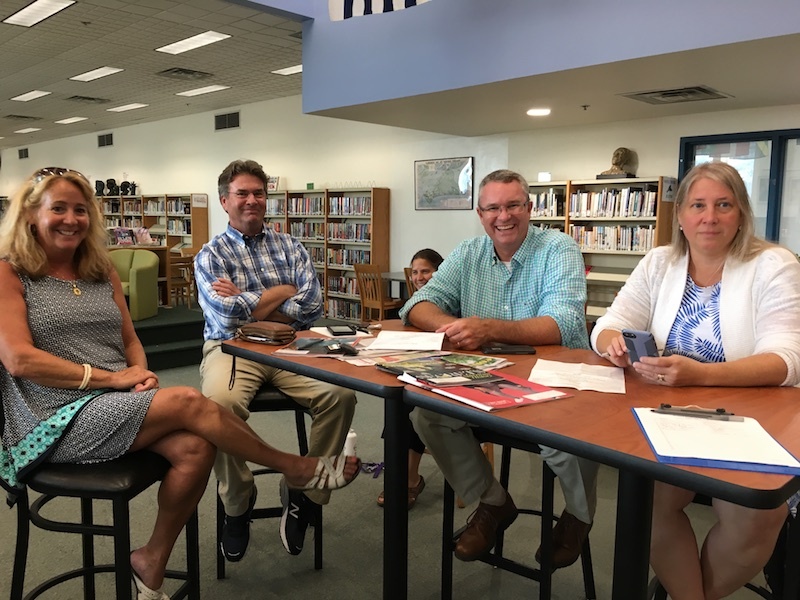 The All-Island School Committee took time at a meeting last week to set the tone for leadership and conduct in future discourse. Over the summer, two high school committee meetings were cut short due to low attendance and disagreements. At the all-Island committee meeting last Thursday, Tisbury school committee member Amy Houghton brought some practices of effective school committees published by the Center for Public Education, which she read aloud to the group. According to the standards, effective school committees embrace data, focus on policies rather than operation of schools, have consistent attendance and lead as a united team. “On occasion, it has seemed our meetings have seemed more contentious than they need to,” Ms. Houghton said. She suggested the committee agree on specific norms to stick to as they tackle future issues. “How do we get to a point where . . . if we have a disagreement, how do we walk out of the room and still be able to shake hands and say, I respect your position,” she said. Committee members emphasized the need to listen more deeply to each other and to school principals, most of whom were present at the meeting at Mr. D’Andrea’s invitation. After a discussion of which values should be included, Mr. D’Andrea agreed to write a draft of the standards for the next meeting. Mr. D’Andrea also clarified the purpose and responsibilities of the All-Island School Committee. The committee is responsible for hiring the superintendent, assistant superintendent, school business administrator, and administrators of special education. Members also evaluate the superintendent, oversee his budget, and participate in collective bargaining with workers’ unions. In other business, Mr. D’Andrea said he has been working with representatives from the two Island educational unions to decide on dates for contract negotiations. Three-year contracts for teachers, administrative support personnel, educational support personnel, food service workers, and custodians expire in August of 2019. Mr. D’Andrea said he hoped to begin the process later this month or early next month. School committee members Robert Lionette, Kate DeVane, Colleen McAndrews, Lisa Reagan and a representative from the Edgartown school committee will participate in the negotiations. The committee voted Thursday to elect Ms. Houghton as chairman and Jeffrey (Skipper) Manter 3rd as vice-chairman. They will succeed Michael Marcus and Kris O’Brien. “I never saw a position I turned town,” said Mr. Manter, who serves on the high school committee, the up-Island regional district committee, the facilities sub-committee, and as a selectman in West Tisbury among other things. Mr. D’Andrea also reported that the MedStar consultants who evaluated Island school health and well being curriculum last year will return to present their findings this week. A public forum will be held Thursday at the Performing Arts Center from 6 p.m. to 8 p.m. Cheers to Jeffrey Skipper Manter III !!! We serve together on the Up-Island Council on Aging Board and he runs a pretty tight ship as the Chairman. Skipper and I respect and value each others opinion in our discussions at the Howes House luncheons quite often.